Impress potential clients with a cutting edge conference room audio/video system. Omni Cabling designs, wires, and installs TV screens, projectors, projector screens, in-table A/V ports/network ports, sound systems, and more. Our seamless conference room a/v systems are designed so even a tech novice can use them without calling the IT department. Upgrade your restaurant menu boards to eye-popping, crystal clear, digital menu screens. Omni Cabling will work with you to design a system that is easy to update with item and price changes saving you hundreds over the cost of printed menu boards. Create an inviting atmosphere for your customers with lobby screens. 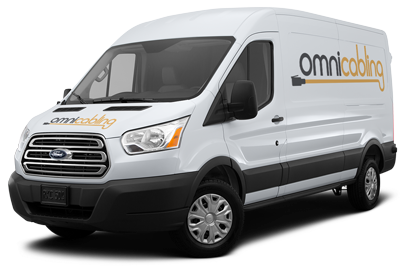 Omni Cabling will install a lobby screen system that can display product and service information, weather forecasts, and even a custom greeting message for your customers. High quality sound systems will make your guests feel at home. Omni Cabling offers a number of speaker solutions including, in-ceiling, wall-mounted, and indoor/outdoor.